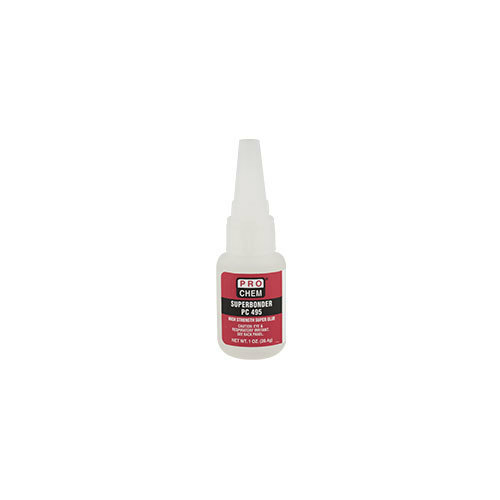 SUPERBONDER PC 495 | Pro Chem, Inc.
SUPERBONDER PC 495 is a low viscosity, instant adhesive that cures on contact at room temperature. This general purpose adhesive is perfect for general maintenance and repair on rubbers, metals and plastics. It is quick to use with no clamping, no mixing and no waiting. Use on clean surfaces. Apply adhesive sparingly to one surface. Assemble and apply pressure until set. Cure times may vary based on the material being bonded. Typically, fixture is achieved in less than 20 seconds. Ambient surface moisture will initiate the hardening process. Handling strength is reached in a short period of time and varies depending on environmental conditions and substrates being bonded. Product will continue to cure for at least 24 hours before full strength and resistances are developed. The gap of the bond line will affect set speed. Smaller gaps tend to increase the speed. Activators can be applied to improve set speed but may also impair overall adhesive performance.